At the Fresh Farm, we learn new things about food all the time. We hope our recipes do this for you too! Since Victoria arrived at HelloFresh, she’s been pulling new interesting ingredients out of her sleeve at every turn! Have you heard of gram flour? It’s made from ground chickpeas and it’s very popular in India, Pakistan and Bangladesh. It’s a rich, tasty alternative to normal wheat flour and works well with savoury recipes. Enjoy! Finely chop the chilli (if you like things hot, you can use more than specified!). Cut the spring onions in half lengthways, then slice them as finely as your knife skills allow. 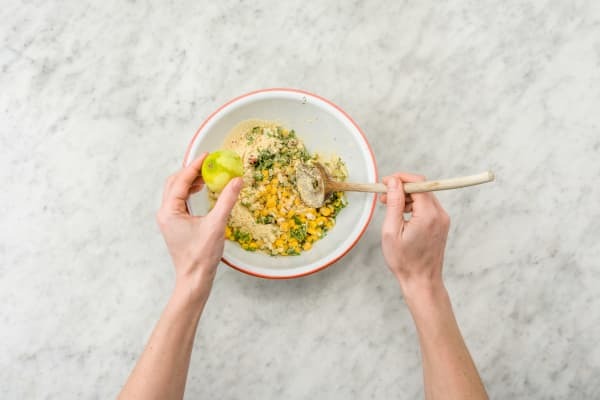 Roughly chop the coriander, zest half the lime and drain the sweetcorn. Add all to a bowl and squeeze in the juice of half the lime. 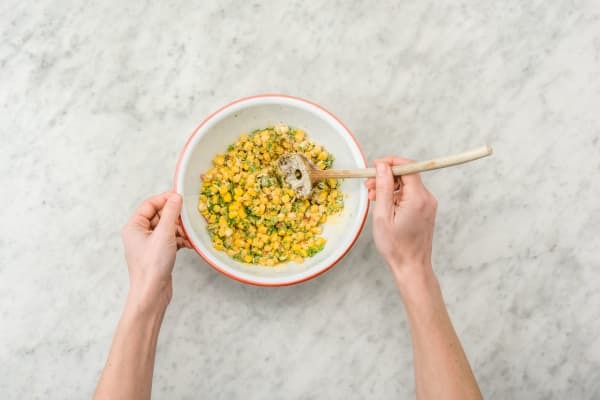 Mix the gram flour with ¼ tsp of salt and a good grind of pepper and add this to your bowl. Give everything a good stir before adding 50ml of water and stirring everything together again. Leave to the side for a few mins while you make the salad. Chop the cherry tomatoes into quarters. Cut lengthways into the avocado and move your knife around the stone in the middle. Twist the two halves and pull them apart. 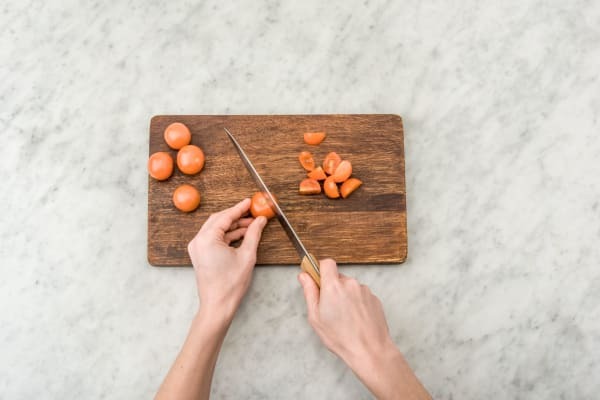 Tip: To remove the stone you can chop down onto it with your knife and if your knife is sharp it’ll stick into the stone and make it easy to pull out. Slip a spoon around the edge of the avocado to pop the avocado out of its skin. Once you’ve done that chop it into 2cm chunks. Put the tomatoes and avocado in a bowl, crumble over the feta cheese, drizzle over the seville orange & honey dressing and add in the pumpkin seeds. Toss together. Put 3 tbsp of oil in a frying pan on medium-high heat. 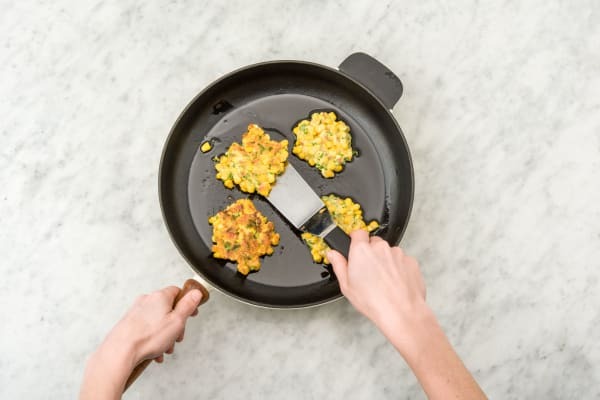 Once your pan is hot, spoon in separate heaped tablespoons of the batter (we made four fritters in total but you can make smaller or bigger ones if you wish!) and cook for 5 mins, before turning over to cook for 3-4 mins on the other side. Tip: Watch out for any spitting oil and add some more oil to your pan if it gets a bit dry. Once cooked, remove to a plate covered in kitchen paper (to soak up the oil). If you have more batter, then repeat the process. 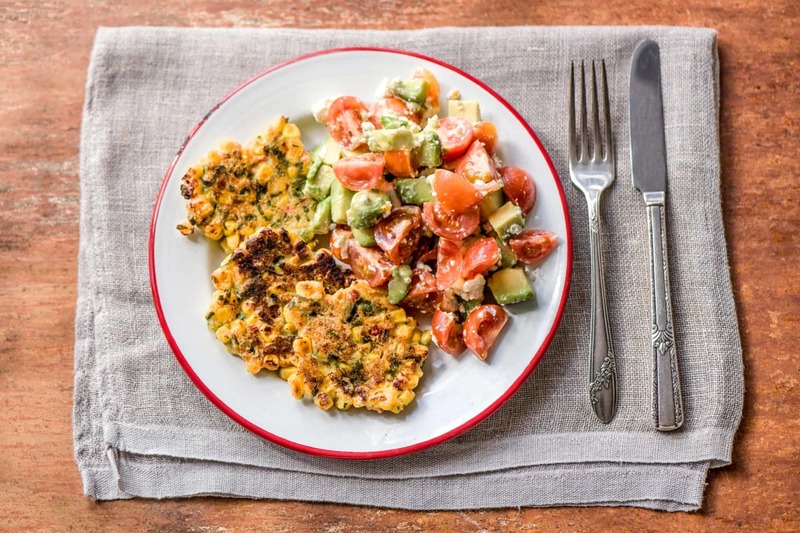 Serve your sweetcorn fritters with your salad on the side and enjoy!